Understated swagger. It's the type of confidence that comes from achieving your goals-step by step. 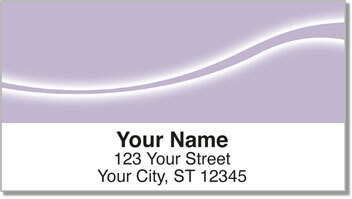 Introducing Simple Swoosh Address Labels from Check Advantage. These unique labels were created for people like you-people who understand that basic doesn't have to be boring. The hallmark of this design, its gentle arcing wave, is offset by an aura of brilliance. Together they convey a very real sense of momentum and purpose. Theses self-adhesive labels save time when you're sending mail and can be used to label much more than envelopes. Order your very own Simple Swoosh Labels now! We also offer matching Simple Swoosh Personal Checks!